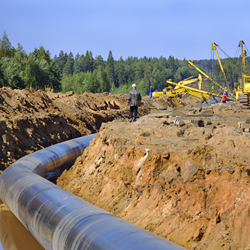 Arenstein & Andersen Co., LPA represents Harrison County landowner in eminent domain case against pipeline company. The Harrison County Court of Common Pleas, the Honorable Judge T. Shawn Hervey presiding, made the ruling in Sunoco Pipeline L.P. vs Carol A. Teter, Trustee of the Carol A. Teter Revocable Living Trust, et al., Case No. CVH 2015-0058. Sunoco filed its appropriation lawsuit May 19, 2015 seeking permanent and temporary easements across the Landowner’s farm to build its Mariner East 2 Pipeline (the “Pipeline”). The Pipeline would run from Scio, Ohio to Marcus Hook, Pennsylvania, carry only pure (99%+) liquefied propane and butane, have two junctions in Ohio (“on ramps”) and eight in Pennsylvania, including the terminus at a Sunoco plant in Marcus Hook. At least four Pennsylvania junctions would contain “off ramps” where Sunoco could offload propane to Pennsylvanians. Sunoco plans no such Ohio “off ramps”. According to Court documents, the Landowner presented three theories against the appropriation: (1) Sunoco is not a “common carrier”, (2) the Pipeline does not serve a “public purpose”, and (3) pure liquefied propane and butane are not “petroleum” under Ohio Revised Code §1723.01. In Court documents, the Landowner alleged that several facts negate Sunoco’s argument that the Pipeline is a common carrier and has a public purpose. First, the Landowner argued that if these plants were built in Ohio, and not in Pennsylvania, then Ohioans could reap the benefits of Ohio’s natural resources. Second, plans for the Pipeline show no “off ramps” in Ohio. The Landowner argued that, other than a few landowners with oil and gas leases, Ohioans would not benefit. Finally, court documents show that at least one of the Pipeline’s committed shippers has publicly indicated that it will ship most of its propane and butane overseas. Dr. Paul H. Matter, who holds a doctorate in chemical engineering from The Ohio State University, testified as an expert witness for the Landowner in this case. According to court documents, Dr. Matter opined that neither “liquefied” propane nor butane would fit any acceptable definition of “petroleum” in the energy field. Despite Dr. Matter's testimony and the Landowner's arguments that this pipeline will not benefit Ohioans, the Court ruled in favor of Sunoco and found specifically that: pure liquefied propane and butane meet Ohio’s statutory definition of “petroleum”; the Pipeline is a common carrier; it is necessary to transport propane and butane; and it services a public use providing consumers access to Ohio products. "This is clearly a Big Oil-friendly ruling," said Attorney Nicholas Andersen, who is representing the Landowner. "Our client is understandably disappointed about the Court's decision. However, this setback has only strengthened our client's resolve to see this matter through, all the way to the Ohio Supreme Court if necessary." The Landowner has appealed the Court’s ruling to the Seventh District Court of Appeals Case Nos. HA-2016-0002 and HA-2016-0005 and has requested a stay of execution of the judgment pending appeal. A hearing has been set for March 4, 2016. Sunoco is represented by Attorney Gregory D. Brunton of the Cleveland based law firm of Reminger Co., LPA. The Landowner is represented by Attorneys Nicholas I. Andersen and Jessica L. Samuel of the Dublin based law firm of Arenstein & Andersen Co., LPA.